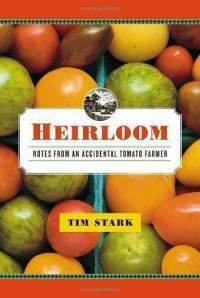 Tim Stark’s Heirloom: Notes from an Accidental Tomato Farmer was a jolly good read. The opening sentence hooked me: An unsustainable writer’s life—hunkered down at a desk on the top floor of a Brooklyn brownstone— proved to be the soil in which the farmer within me took root. Tim Stark knows writing. He knows hard work. And he definitely knows tomatoes. Heirloom is a narrative of the starts and setbacks, the disdain of local farmers and the high praise of five-star chefs, the doubts and difficulties and the joys of growing heirloom tomatoes. An heirloom tomato, according to Wikipedia, is “an open-pollinated (non-hybrid) heirloom cultivar of tomato. Heirloom tomatoes are grown for historical interest, access to wider varieties, and by people who wish to save seeds from year to year.” If you are looking for a practical manual on how to find seeds and grow heirlooms, this is not your book. At best you can glean names and descriptions of varieties: Cherokee Purple, Green Zebra, Garden Peach, Plum Lemon, Radiator Charlie’s Mortgage Lifter, Black Drim, Extra Eros Zlatolaska, Zapotec Pleated. No, this is a book to read for the joy of a ripe garden tomato. The bits on the Mennonite and Amish neighbors delighted me. Stark describes one Old Order Mennonite neighbor—a resourceful friend and mentor—as my guide to all things Anabaptist. That’s the Pennsylvania part of the equation. The other side includes the gourmet chefs who come down to Manhattan’s farmer’s market—Greenmarket—to peruse and purchase produce. It is fun to watch Tim weave through these disparate worlds. I cried reading about the week after 9/11, the peak of harvest, and how providing tomatoes for meals for volunteers brought a slice of normalcy and stability to a city reeling with loss. Again, I am inspired to try my hand at growing heirloom tomatoes. I’ve been inspired before, but haven’t followed the inspiration with perspiration. Or even initiation to find heirloom seeds. I grew Brandywines from seed one year. They were delicious but I’ve never tried again. The tending of the seedlings was a labor of love and required more attention and time than I normally have to devote. I grew some Brandywines from plants purchased at a big box store a couple of times since then but they never seemed quite the same. @Jbbs_Musings – Thank you so much for the link. I bookmarked it for later. Wat a lovely site.